Each class operates on the principle of responsible “freedom within limits.” Children are free to work at their own pace, alone or with others. We encourage a balance of active, self-directed learning with small group collaboration and peer teaching, so that children will problem-solve, see natural connections in knowledge, and create new ideas. Children in this environment learn to make decisions at an early age, to reason, cooperate, negotiate, reflect, and understand. Through direct experience and the process of discovery and investigation, children learn most effectively – and attitudes toward learning remain positive and enthusiastic, not overwhelming. Montessori education is a philosophy with the fundamental tenet that a child learns best within a social environment that supports each child’s unique development. Maria Montessori, M.D., the founder and developer of what is called “The Montessori Method of Education,” based this new education on her scientific observations of young children’s behavior. As the first woman physician to graduate from the University of Rome, Dr. Montessori became involved with education as a doctor treating children. Then in 1907, she was invited to open a childcare center for the children of desperately poor families in the San Lorenzo slums of Rome. 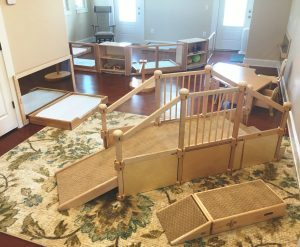 She called it “a children’s house,” and based the program on her observations that young children learn best in a home-like setting filled with developmentally appropriate materials that provide experiences contributing to the growth of self-motivated, independent learners. Dr. Montessori carried her training throughout the world, including the United States, as early as 1912. 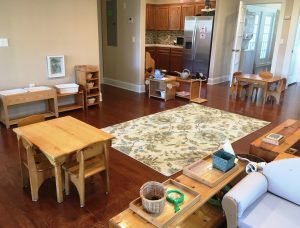 Dr. Montessori developed what she called the “prepared environment,” which possesses a certain order and allows children to learn at their own development, in a non-competitive atmosphere. Dr. Montessori also recognized that the only valid impulse to learning is the self-motivation of the child; children move themselves toward learning. The teacher prepares the environment, directs the activity, and offers the child stimulation, but it is the child who learns and is motivated through work itself to persist in a given task. If Montessori children are free to learn, it is because they have acquired an “inner discipline” from their exposure of both physical and mental order. This is the core of Dr. Montessori’s philosophy. Social adjustment, though a necessary condition of learning in a traditional classroom, is not the purpose of education. The Whole Child Approach: The primary goal of a Montessori program is to help each child reach their full potential in all areas of life. Activities promote the development of social skills, emotional growth, and physical coordination, as well as cognitive preparation. The holistic curriculum, under the direction or a specially prepared teacher, allows the child to experience the joy of learning, time to enjoy the process, and ensures the development of self-esteem. This curriculum also provides the experiences from which children create their knowledge. The ‘Prepared Environment’: In order for self-directed learning to take place, the whole learning environment –room, materials, and social climate- must be supportive of the learner. The teacher provides the necessary resources, including opportunities for children to function in a safe and positive climate. The teacher thus gains the children’s trust, which enables them to try new things and builds self-confidence. The Montessori Materials: Dr. Montessori’s observations regarding the sorts of things which children enjoy, and go back to repeatedly, led her to design a number of multi-sensory, sequential, and self-correcting materials, which facilitate the learning of skills and lead to the learning of abstract ideas. The Teacher: The Montessori teacher functions as a guide within the environment, a role model, a demonstrator, a record-keeper, and a meticulous observer of each child’s behavior and development. The teacher operates as a facilitator of education for the whole child. A fully certified Montessori teacher must have as a minimum, a B.S. or B.A. degree followed by extensive Montessori training, and then complete a one-year internship in a Montessori classroom that is age-appropriate for their training. Every program has its set of ground rules which differs from age to age, but is always based on the core Montessori philosophy: respect for oneself, one another, and for the environment. Children are free to work at their own pace with materials they have chosen, either alone or with others. The teacher relies on his or her observation of the children to determine which new activities and materials he or she may introduce to an individual child or to a small or large group. The aim is to encourage active, self-directed learning and to strike a balance of individual and small group collaboration within the whole group community. The age span in each class provides a family-like grouping where learning can take place naturally. More experienced children share what they have learned while reinforcing their own learning. Because this peer group learning is intrinsic to Montessori, there is often more conversation, and more language experiences, in the Montessori classroom then in a traditional early education setting.